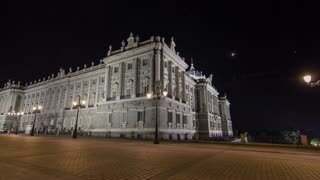 Sunset hyperlapse of the Royal Palace of Madrid (Palacio Real), the official residence of the Spanish Royal Family. Tourists travel couple taking selfie self portrait photograph using smart phone by Royal Palace of Madrid, Spain, People sightseeing Spanish tourist attractions landmarks, Palacio Real de Madrid. Young couple walking holding hands happy and romantic in front of Royal Palace of Madrid, Spain, Tourists traveling in Europe visiting Spanish tourist attractions landmarks, Palacio Real de Madrid. Madrid Spain - Royal Palace of Madrid. Landmark building and a main Spanish tourist attraction Palacio Real de Madrid. 4K timelapse of people walking on a sunny day around the Royal Palace of Madrid (Palacio Real), the official residence of the Spanish Royal Family. Spectacular facade of Queluz National Palace or Palacio Real de Queluz in Sintra, Lisbon district, Portugal. The Royal Palace of Queluz was the summer residence of the Portuguese royal family.